What is a Holiday Shop? 3 Free Sign Up Bonuses of $100 Value! Perfect for an in-store contest or raffle. 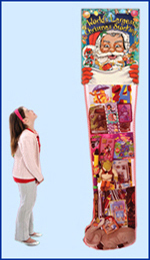 Terrific 8 ft tall giveaway display full of cool toys.